Sprint offers HTC One in glamor red | Android Blast! Sprint is on a roll lately with exclusive colors for their phones. They just launched a purple Galaxy S4, and now they have an exclusive on the HTC One. Starting tomorrow, August 16, Sprint will launch an exclusive "glamor red" version of the HTC One. The new red phone will cost $199 on the standard 2-year contract. At the same time Sprint is launching a FM radio service called NextRadio. With NextRadio, listening to FM radio on smartphones offers a new type of interactive radio listening experience. When compared with streaming, NextRadio consumes about three times less battery life than other music apps. That�s because the audio is coming through a built-in FM tuner instead of over the Internet. NextRadio is a free app that comes preloaded on HTC One from Sprint for all new activations. 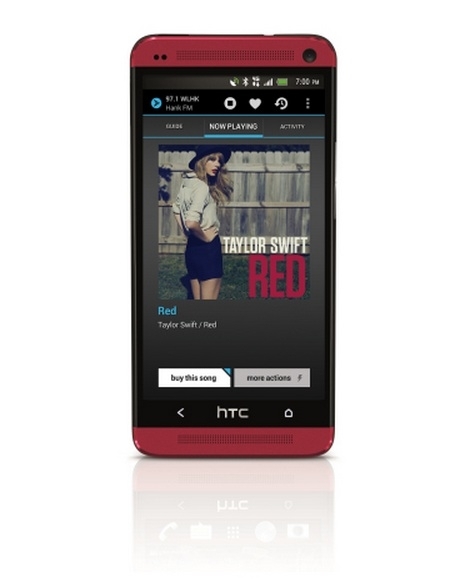 Customers who already own HTC One or HTC EVO 4G LTE from Sprint can download NextRadio through Google Play� at no additional charge. Head down to your local Sprint store tomorrow to check out the "glamor red" HTC One.